A photojournalist who reports on anti-fracking protests had his conviction for obstructing the highway overturned on appeal today. Peter Yankowski Walker, who has been covering the protests for about four years, was acquitted at Bolton Crown Court by a judge and two magistrates. “I truly believe that we need to be able to witness history as it happens. “It is very important that people capture what is happening in an unbiased way close up. 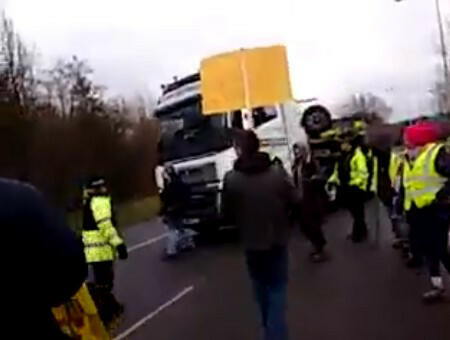 The prosecution case was that he tried to slow down a lorry at the end of an anti-fracking protest near a depot in Bolton in February. The depot had been the focus of multiple protests because it belonged to A E Yates, the main construction contractor at Cuadrilla’s shale gas site at Preston New Road near Blackpool. Mr Walker said he had been at the protest for about five minutes and he was in front of the lorry for about three seconds. But the Manchester court imposed a conditional discharge for 12 months and ordered Mr Walker to pay £150 costs and £20 victim surcharge. “I have never been arrested before this. “I did not intend to stop the wagon or obstruct the highway. I intended to keep myself safe. “It would have been really stupid to jump in front of a wagon. Why would I risk getting a mark against me? Mr Walker said the arrest had affected his work covering protests at Preston New Road. “I have been threatened with arrest by the police since then. “The police and security at Preston New Road knew my name.